Preheat one side of grill to medium-high, the other side to medium-low. In a nonstick saucepan over medium heat, add the olive oil. Saute onions in oil until soft, about 2 minutes. Stir in vinegar, ketchup, brown sugar, Worcestershire, Dijon and a little salt and pepper. Bring sauce to a boil, reduce heat and simmer until reduced to 1½ cups, about 10 minutes. Set aside 1 cup sauce for serving. Brush turkey tenderloins with ¼ cup remaining sauce. Grill turkey, covered, on medium-low side of grill, 4 minutes. Flip turkey, base with 2 tablespoons sauce and grill 4 minutes. Baste again with 2 tablespoons sauce and transfer turkey to medium-high side. Cook basted turkey, until an instant read thermometer registers 165 degrees, about 4 minutes. Remove turkey from grill and let rest for 5 minutes before slicing. Drizzle remaining sauce that was set aside over turkey slices and serve. Preheat oven to 350 degrees. Place turkey tenderloins in a 9×9 baking pan. Cut pieces if too large. 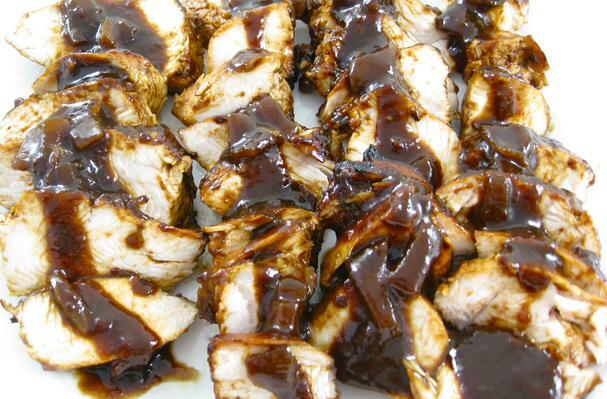 Reserve 1 cup sauce for serving and with remaining sauce, spread ¼ cup over top of tenderloins. Reserve ¼ cup for broiling. Cover pan with foil and bake for 35-40 minutes. Preheat broiler, cover cooked tenderloins with ¼ cup sauce and broil for about 3 minutes, until browned. Remove turkey from oven and let rest for 5 minutes before slicing. Drizzle the 1 cup sauce that was set aside, over turkey slices and serve. If you’ve never made a turkey tenderloin, you’re in for a treat. It’s a delightful cut of meat, easy to prepare and very tender. This is not your typical boring and bland turkey recipe either. The balsamic reduction sauce is bursting with flavor. Grilled or baked this recipe taste wonderful so we’ve included the directions both.